Master timeless skills and build a project that makes you proud. 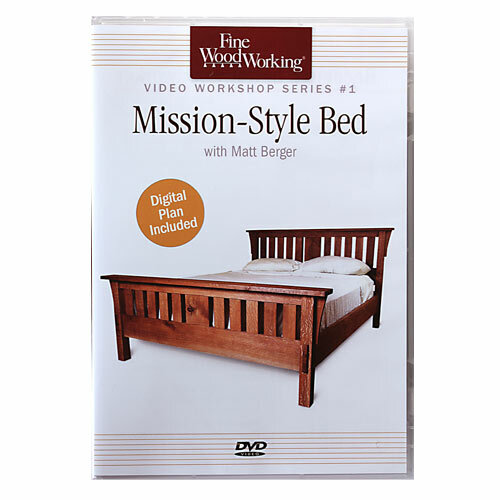 Fine Woodworking's video workshop DVD series was developed to demonstrate important woodworking techniques while building a specific project - such as this Mission-Style Bed. Geared for beginners and intermediate woodworkers, this 50-minute video features Fine Woodworking experts, teaching basics and guiding you through the process.Building this - or any bed - just got a whole lot easier. While this project is in the traditional Arts and Crafts style, it involves fundamentals that apply to building a bed of any design, simple or elaborate. More than show and tell, this video expands your know-how and includes: step-by-step instructions, three techniques for machine-cut mortise-and-tenon joinery, shop tips, and lumber-buying strategies that save money.